This was the first time I had attempted an outdoor communion portrait in February. The biggest storm of the winter had blanketed the Northeast with about a foot of that white powdery stuff only a few days before. Fortunately my client has a big beautiful front porch which is one of my favorite locations for shooting natural light portraits. My young model braved the frigid temperature and a chilling breeze to pose for me in her Communion dress. If you'd like to have both indoor and outdoor communion photos taken, it's never an issue. 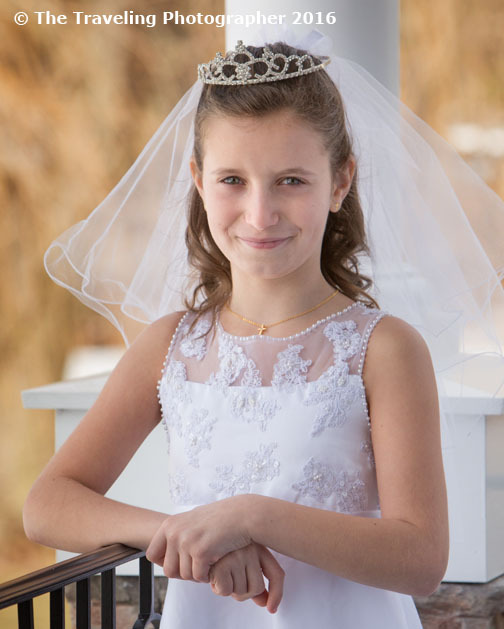 In fact, the majority of The Traveling Photographer's first Holy Communion Photography clients have both inside and outside portraits taken. Of course we took quite a few indoor portraits too. But why did we wait until February? Unfortunately, the client had some tough challenges to get through during the traditional holy communion season of April and May. Luckily the gown still fit my model perfectly and we experienced another fun and successful location photography session. This young lady is the youngest of the four children and sadly the last one I'll get to take Holy Communion photos of. I am sure I'll return to my client's home for some family portrait photography soon. It's been a few years since the last one was taken and we've already talked about two locations in their yard that will are good locations for posing and lighting. It's one of the features that I wanted to make unique about The Traveling Photographer. Finding or creating natural looking light and taking portraits in environments in southern New Jersey where my subjects feel most comfortable. 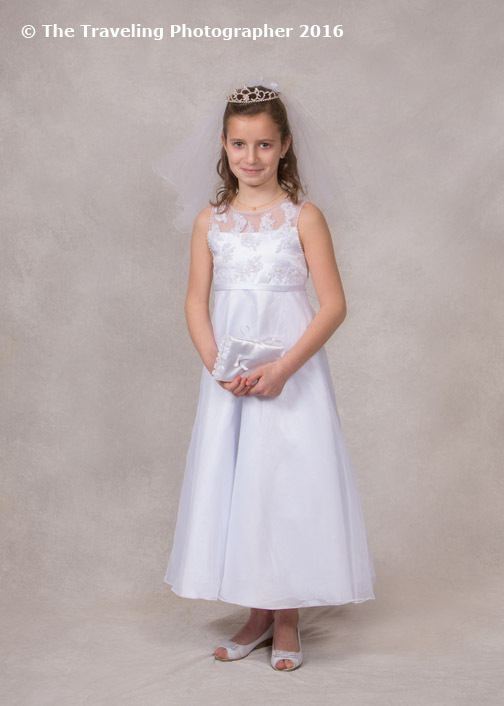 A child's First Holy Communion is a milestone event. February is not a usual time for Communion or outdoor portraits, but you can get lucky sometimes with seasonable weather and a courageous subject.